To date, the Make-A-Wish Foundation has fulfilled the wishes of more than 250,000 kids with life-threatening illnesses. Here’s the story of the wish that started it all. In 1977 an Illinois woman named Linda Greicius made a trip to Phoenix, Arizona, to spend time with her mother, who had recently been widowed. Greicius brought her five-year-old son Chris with her. As soon as they arrived, the grandmother insisted that Chris didn’t look well and should see a doctor. Greicius obliged, and that’s when she got the kind of news that all parents pray they will never get: Chris had stage-four leukemia and had less than three years to live. Greicius believed Chris would receive better care in Phoenix, so she made plans to stay there indefinitely. She also decided that she and Chris would squeeze as much life as they could out of whatever time he had left. 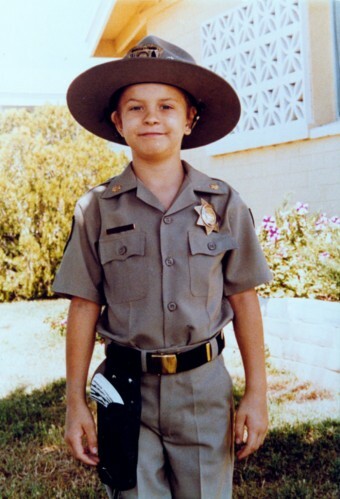 Chris was a big fan of CHiPs, the TV show about California Highway Patrol motorcycle officers. He wanted to be a police officer when he grew up, illness or no illness, so many of his playtime adventures had a police theme. Greicius bought him a battery-powered highway patrol motorcycle that Chris could ride for fun and also use in place of a wheelchair when he was too fatigued to get about on his own. A family friend named Tommy Austin was an officer with the U.S. Customs Service, and Chris was always talking about wanting to help him catch bad guys. Austin really wanted to oblige, but bureaucratic hurdles within the agency made it difficult for him to do much. One day in the spring of 1980, Austin shared his frustration with Ron Cox, an Arizona Department of Public Safety (DPS) officer, while the two men were on a stakeout. Austin also expressed his concern that Chris might not live much longer. Cox said he would check with his DPS superiors to see if his agency could help. The DPS director, a man named Ralph Milstead, was moved by Chris’s story and gave Cox free rein to do whatever he wanted. That was all Cox needed to hear. There was no time to spare, so he got to work: since Chris was so determined to become a police officer—why not make him a member of the force? Cox and some colleagues quickly planned a special day for the DPS’s newest recruit: On April 29 a police helicopter arrived at the hospital where Chris was being treated and whisked him off for an aerial tour of Phoenix. Afterward it landed at DPS headquarters, where Chris was welcomed by three state troopers in their cruisers, plus a motorcycle officer named Frank Shankwitz. Chris and his parents then toured the headquarters. Afterward, Chris was presented with a real Smokey the Bear–style state trooper’s hat and badge and was sworn in as the agency’s first—and to date its only—honorary police officer. The day was an emotional one not just for Chris and his parents but also for Cox and his colleagues. Why stop there? Cox contacted the company that supplied DPS uniforms and ordered one in Chris’s size. (The store owner and two employees stayed up all night working on the uniform so that it would be ready by morning.) On May 1, officers brought the uniform to Chris’s house. After he changed into it they set up cones in the driveway so that Chris could qualify for his motorcycle officer’s wings by driving his electric motorcycle through an obstacle course. Chris passed the test and was awarded a real police motorcycle helmet for his efforts; his wings were on order and due to arrive following day. 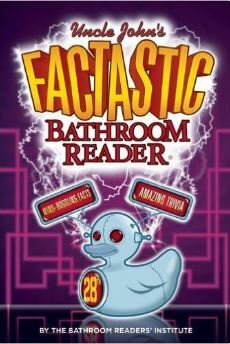 But that evening he took a turn for the worse and had to be admitted to the hospital. By the time Frank Shankwitz brought the wings to his hospital room on May 2, Chris had slipped into a coma and was not expected to live more than a day or two. So Shankwitz pinned the wings on Chris’s uniform, which his parents had hung next to the hospital bed where he could see it. Chris’s body was returned home to Illinois, where he received a full “fallen officer” police funeral. He was buried in his uniform, and the words “Arizona Trooper” were inscribed on his headstone. The Arizona DPS sent Frank Shankwitz and another officer, Scott Stahl, to Illinois to attend the service. On the flight back to Arizona, Shankwitz and Stahl marveled at how Chris and his family had been able to forget his illness for a few hours, even as sick as he was. Why shouldn’t other kids and their families facing the same challenges have the same opportunity? When they got back to Arizona, Shankwitz, Stahl, and Greicius decided to start a fund to help other terminally ill kids realize their dreams, just as Chris had. Five people chipped in $37.76 to get the Chris Greicius Make-A-Wish Memorial off the ground. The first outside donation came from a local grocer who contributed $15. By March 1981 the organization had raised more than $2,000, enough to grant its first wish to seven-year-old Frank “Bopsy” Salazar who, like Chris, had terminal leukemia. Bopsy wanted to be a firefighter, so this time it was the Phoenix Fire Department that stepped up. The department hosted a lunch for Bopsy at Station 1, made him an honorary member of the Engine 9 crew—complete with his own firefighting suit—and let him operate the siren when the crew responded to fires. Between calls, Bopsy got to turn the water hose on some cars parked in an alley behind the station. The memorial fund also arranged for the boy and his family to take a trip to Disneyland; when they arrived in Los Angeles, they were escorted to and from the park in a fire engine, courtesy of the Anaheim Fire Department. When Bopsy’s illness worsened a month later and he was admitted to the hospital, his friends at Station 1 drove to the hospital in the ladder truck and used it to climb through the window of his third-floor hospital room. The excitement of his visitors coming in through the window caused Bopsy to rally, and he was able to go down and see the ladder truck. He passed away before morning. 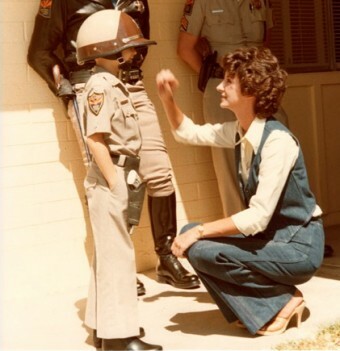 The Chris Greicius Make-A-Wish Memorial might well have remained a local charity administered by Arizona DPS officers in their spare time had NBC not learned of the charity and profiled it on a news show in the spring of 1982. After the show aired, the DPS was deluged with calls from people all over the country who wanted to start similar organizations in their communities. In May 1983, the charity reorganized itself into the national Make-A-Wish Foundation to help them do just that. By the end of the year, six chapters had opened around the country; in 1984 the number grew to 28. And as of 2015 there are more than 62 chapters in the United States, plus affiliates in 47 other countries. Together they grant more than 14,000 wishes a year—an average of one wish every 38 minutes. Another thing that’s changed about the Make-A-Wish Foundation since its founding more than 30 years ago is that it no longer grants wishes just to terminally ill children. Advances in medical care have made survival of many diseases more likely, including the one that claimed both Chris Greicius and Bopsy Salazar: where once leukemia was a virtual death sentence for a child, today 70 percent of children diagnosed with acute lymphocytic leukemia, the most common form of childhood cancer, will be cured of the disease. Add to this the fact that the Make-A-Wish Foundation raises tens of millions of dollars every year and that companies like Disney are happy to donate their services, and it becomes possible for Make-A-Wish to serve any child with a life-threatening illness, not just those who have received a terminal diagnosis.